The QC-8 is a cost-effective and versatile machine for filling and sealing containers with pre-cut foil, which offers a good solution for higher volume production requiring a tamper-evident, heat-sealed container, and accurate filling. 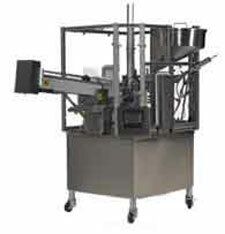 The QC-8 automatically dispenses containers, fills product, and applies a tamper-evident heat seal or snap-on over cap lid, at rate of up to 45 containers per minute. (depending on viscosity and volume to be filled) The QC-8 is designed to handle a variety of product, from yogurts and pudding to dry products and powders. The compact design makes it ideal for producers with limited space. The QC-32 is a cost-effective and versatile machine for filling and sealing containers with roll stock film or pre-cut foil, which offers a good solution for higher volume production requiring a tamper-evident, heat-sealed container, and accurate filling. The QC-32 automatically dispenses containers, fills product, applies a tamper-evident heat seal, and if required a snap-on over cap lid, at a rate up to 45 containers per minute. 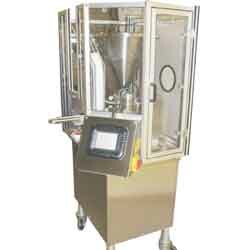 (depending on viscosity of product and volume to be filled) The QC-32 is designed to handle a variety of product, from yogurts and pudding to dry products and powders. The compact design makes it ideal for producers with limited space. The QC-80 is a cost-effective and versatile machine for filling and sealing containers with roll stock film or precut foil, which offers a good solution for higher volume production requiring a tamper-evident, heat-sealed container, and accurate filling. 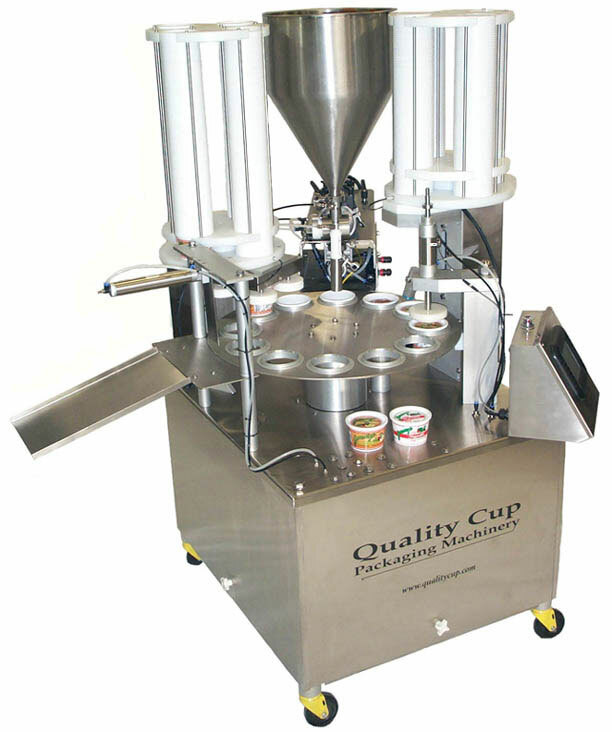 The QC-80 automatically dispenses containers, fills product, applies a tamper-evident heat seal, and if required a snap-on over cap lid, at a rate up to 45 containers per minute. (depending on viscosity of product and volume to be filled) The QC-80 is designed to handle a variety of product, from yogurts and pudding to dry products and powders. The compact design makes it ideal for producers with limited space.